for $949,000 with 2 bedrooms and 2 full baths. 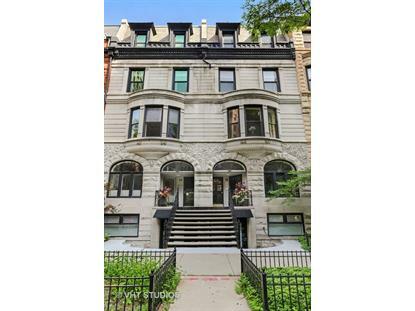 Absolutely stunning 2 bedroom, 2 bathroom duplex in a gorgeous greystone walk-up on the quiet east end of Elm Street in heart of the Gold Coast! 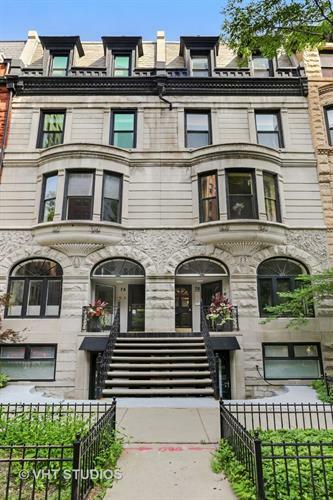 This unit has been updated w/the highest quality finishes & completely new windows. The white kitchen features Viking appliances, large veined quartz island and opens to a spacious living room w/gas fireplace overlooking tree-lined Elm St. Multiple skylights throughout allow for tons of natural light. Separate dining room & beautiful diagonal hardwood flooring. Grand staircase w/glass detail & Hunter Douglas Silhouette Shades throughout. Giant master suite has a fireplace, built-in closets & a spacious master bathroom w/dual vanity & large glass shower. The 2nd bedroom features generous closet space & en-suite bathroom. Private rooftop deck is perfect for entertaining. Full laundry room w/new washer & dryer. Just steps to Oak St Beach, Michigan Ave & Oak St shopping & restaurants on Rush. Parking available at 30 E. Elm/$340-$390 per month.